The main base for crémant is Pinot Blanc, followed by Auxerrois. This explains why a full 21% of the Alsace vineyards are cultivated with these two grapes. However, increasingly important are Chardonnay, which adds racy acids and toasty finesse, as well as Pinot Noir. Just as in Champagne, Pinot Noir based sparklings are a bit rich more fruity and a bit fuller. 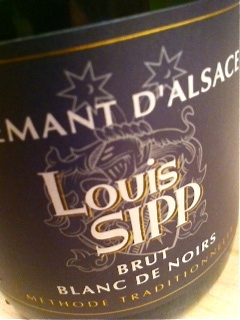 Crémant Blanc de Noir from Louis Sipp in Ribeauvillé is deep coloured with a redish tint. The aroma is very fruity, dominated by cherries. On the palate, this crémant is very full, yet nice and dry with lingering acidity and a trace of tannins in the aftertaste, perhaps the result of a moment of maceration? A real mouthful! Price: € 11.